Gold prices jumped to their highest dollar value since mid-July in London trade on Tuesday, hitting $1,236 per ounce as world stock markets fell after China's main index erased most of yesterday's stimulus-fueled rally. Gold prices came within 40 cents of $1,240 per ounce – adding 6.8 percent from August's plunge to start-2017 levels – as geopolitical tensions rose with Turkey's President Erdogan detailing what Ankara's intelligence services claim is the "naked truth" about the Saudi murder in Istanbul of U.S.-based journalist Jamal Khashoggi. Silver yet again failed to follow gold higher, trading up to only one-week highs at $14.80 per ounce as crude oil hit one-month lows and other industrial commodities fell. Shanghai's CSI 300 index lost 2.7 percent and the yuan dropped to new 21-month lows versus the dollar even as Beijing followed the weekend's raft of supportive measures and promises with new support for private debt and another $17 billion "liquidity injection" of short-term loans to commercial lenders. "Nobody expected the policy effect to fade out so soon," as the South China Morning Post quotes one Hong Kong analyst. "The last two weeks of steep correction indicate that the A-share market is in panic mode," says brokerage CLSA in a note on China's domestic yuan-denominated equities. The price of wholesale gold bullion bars rose faster still on Tuesday for non-U.S. investors, gaining 1.3 percent for the week so far in euro and Sterling terms as the EuroStoxx 600 index fell 1.1 percent and London's FTSE-100 fell below the 7,000 mark – a new record high when first reached this March. Wall Street futures put the S&P500 on track to open lower yet again, heading for its 14th loss in 17 sessions so far this October. Alongside gold prices, developed-world government bond prices also rose, cutting the cost of borrowing for Western governments. But Asian, African, East European and Latin American bond prices fell, adding extra stress to emerging-market borrowers. 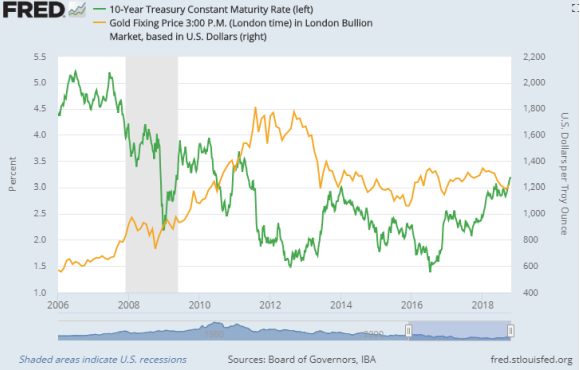 The flight into Treasuries drove the 10-year U..S bond yield down another five basis points to 3.15 percent, almost one-tenth of a percentage point below this month's new seven-year highs. Italy's bond yields also eased back on Tuesday but not as fast as other Eurozone markets after Rome's Council of Ministers approved the left-right coalition government's 2019 budget plans, including the "Quota 100" early retirement scheme, requiring 38 years of state-pension contributions. Life expectancy in Italy currently stands above 83 years old and is forecast to keep rising. Rome's spread over German Bund yields today rose back above 300 basis points – the five-year high reached last month – and the spread over Spain's borrowing costs rose back near this month's 20-year high. "The 'spreadonomics' is unforgiving," says Italian financial newspaper Il Sole 24 Ore, "and governments cannot free themselves from the judgment of investors."